The Holocaust is one of the most tragic episodes in human history. 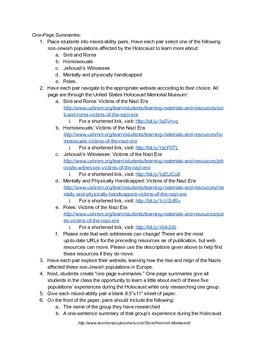 Expand your students' understanding of the Holocaust and pay respect to all the diverse peoples who lost their lives during the Holocaust by introducing students to some of the Nazis' non-Jewish victims. 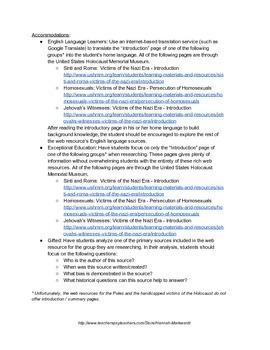 In this lesson, students will examine the impact of the rise and reign of the Nazi regime on non-Jewish minority groups; use Internet resources to research the specific ways in which several non-Jewish minority groups were affected by the Nazis; and summarize complex information, both verbally and visually, to communicate learning to classmates. This resource is aligned with the Common Core State Standards for Reading and Writing and includes accommodations for Exceptional Education, English Language Learners, and Gifted students. It also includes rubrics and an answer key.